The hazard of doing so much travelling around interesting towns is that I end up with more retail-related photographs – and topics to blog about – than I ever have time to cover. Back in February I spent a lovely (but occasionally wet) few days in the South West, managing to combine sightseeing around beautiful Cornwall and buzzing Bristol with visits to no fewer than 11 ex-Woolies. 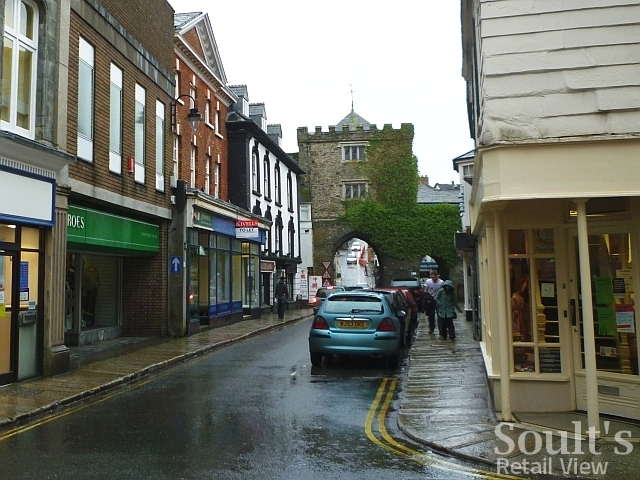 I plan to blog about all of these over the coming weeks, but first up is one of the most historically interesting former Woolworths sites I’ve come across – the one in the delightful town of Launceston (pronounced ‘Lanson’), in Cornwall (store #812), which opened as Woolies in 1953 but closed twenty years later. Regular readers will know that many of the Woolworths I’ve blogged about in the past feature the distinctive architecture that characterised the chain’s purpose-built stores of the 1920s and 30s. This is barely surprising, given that between the opening of Redcar (#275, and one of the early examples of the design) in 1927 and Belper (#725, and one of the last) in 1938, Woolworths’ store count grew by 450 shops – an astonishing rate of growth, even by modern standards. After the war, however, it was the 1950s before Woolworths really started to grow again, adding another 250 or so shops during that decade. By this time, Woolies stores were tending to occupy modern premises in new towns and shopping precincts – such as Brentford (#829, opened March 1954) or Peterlee (#987, opened c.1958) – alongside some infilling in smaller market towns that had missed out during the first wave of expansion. 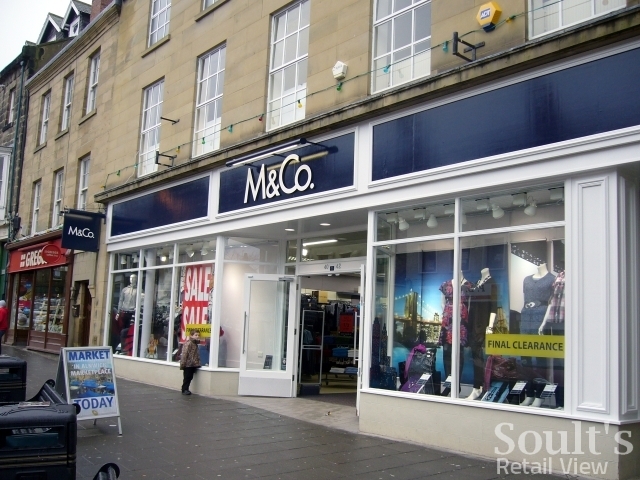 In contrast to the pre-war, new-build approach, new stores in these locations – like Launceston, Alnwick (#822, above) or Hexham (#931) – tended to occupy existing buildings. 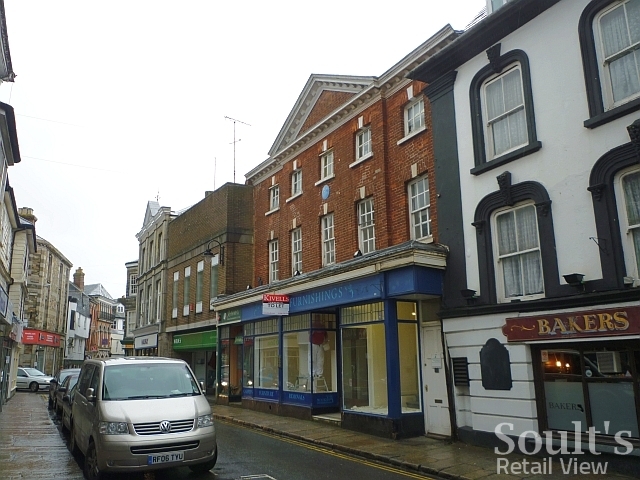 However, prior to Woolworths moving in, few properties can have had such a rich and notable history as the one at 5-7 Southgate Street in Launceston. 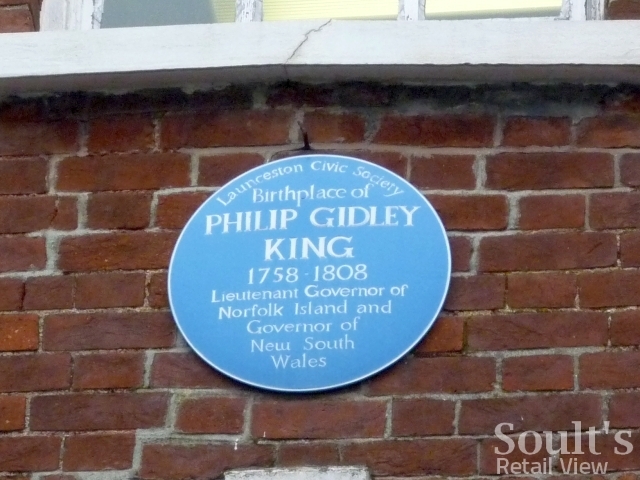 Built as a large town house and shop by Mr King, a ‘clothier’, in the early- to mid-eighteenth century, I understand that the property was subsequently occupied by a Mr Nicolls – selling clothing and groceries – and later by Cookes stores, prior to Woolworths’ arrival. Recognising its architectural and historic importance, the building’s Grade II* Listing today places it among the top 8% of protected buildings in England. However, I understand from local historian Jim Edwards that this very status was what caused Woolworths to pull out from the site, finally closing the doors to its store on Saturday 9 June 1973. It seems that the poor condition of the building, and Woolworths’ inability to secure Listed Building Consent for the modernisations that it wished to make, simply rendered the store too much trouble to keep open. Its twenty-year lifespan as a Woolies makes it, on the scale of things, one of the chain’s shorter-lived stores. Like all Woolworths, however, its presence in the town is fondly remembered. Indeed, when I phoned Launceston Library for further information, the very nice woman who answered revealed that she had – by pure coincidence – worked there herself as a schoolgirl, 43 years ago. One upside of Woolworths’ departure is that the building retains more of its original fabric, both inside and out, than might otherwise have been the case. According to the Listing record, its extant original features include the hornless sashes with thick glazing bars on the front elevation, and original cornices, ceilings and panelling internally. However, ceilings that were still decorated when Woolworths moved in were apparently lost during subsequent modifications. The elegant transomed shopfront, dating from the early 20th century, is also intact, though the discordant modern treatment of the restaurant and shop parts – one section green, the other blue – makes it less easy to appreciate. 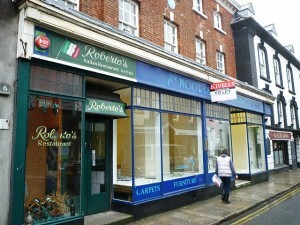 The same shopfront is clearly shown in a c.1960 Francis Frith view, when the store was trading as Woolworths. 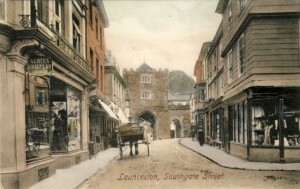 Indeed, the iconic view towards Launceston’s medieval Southgate Arch is one that has changed little over the decades, as comparison of the two similar images below shows. Again, the Frith site features an almost identical view from the 1960s. The Grade II Listed black and white pub – today’s Baker’s Arms, but formerly the King’s Arms, built on what was originally 5-7’s garden – is clearly visible in both views above, as is the building on the corner of Broad Street (today’s Oxfam), also Grade II listed, with its distinctive slate-hung façade. The building on the far left of both shots – today’s Halifax – is also the same, even if it has been rather modified since its days as an ‘Aertex Cellular Depot’. Though the name on the fascia is too faint to make out in the c.1908 view, it was, I believe, a business called Procter and Kent. Perhaps unwisely, the business kept gunpowder, oil and paint on the upper floors; when the upstairs caught fire on one occasion, I’m told that the people of Launceston were treated to an unplanned firework display! The main change between the two views is the replacement of the redbrick building at no. 3 in the top shot, on the site of the present-day Wroes department store. Still present in Frith’s 1960s view, the old building projected further out into the street than its replacement, which is why the property at nos. 5-7 beyond is almost entirely obscured. For any small market town, having a successful independent department store is an incredible asset; it’s just a pity that the building – which presumably predates Wroes’ arrival in 1992 – is so much drearier than the one that it replaced, and rather out of keeping with the surrounding street scene. Back to nos. 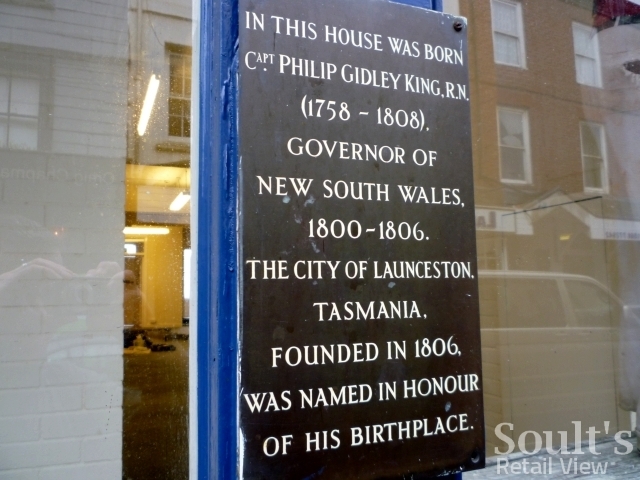 5-7, however, and for all that the property is architecturally important, it is also significant as the birthplace – on 23 April 1758 – of Captain Philip Gidley King RN, one of Launceston’s most famous sons. 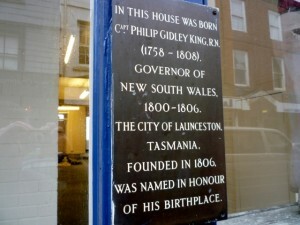 This fact is commemorated by both a blue plaque on the front façade and another plaque attached to the shopfront. 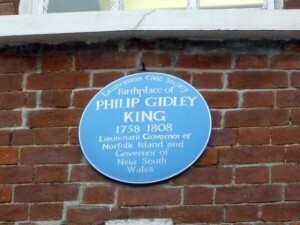 The son of the Mr King who had built the house, Gidley King was the founder of the first European settlement on Norfolk Island, serving as its Lieutenant Governor. Later, in 1800, he became the third Governor of New South Wales, supporting the establishment of settlements in Van Diemen’s Land (today’s Tasmania), including Launceston – named in honour of his birthplace. 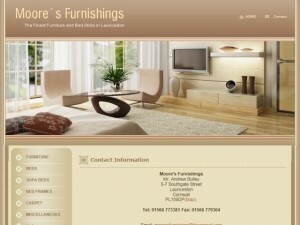 Instead, however, I found the property vacant and ‘to let’ (through Kivells), and seemingly in the midst of redecoration. 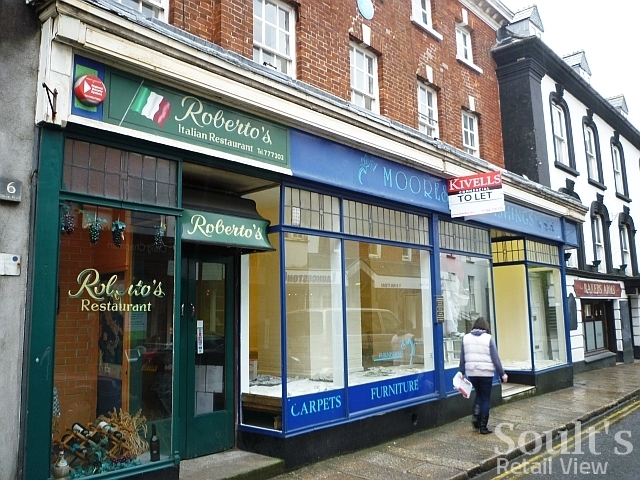 Meanwhile, the Italian restaurant, Roberto’s, that occupies the rest of the street frontage and all of the basement level is also up for sale. I understand that Moore’s had occupied the site for just a few years, following on from other post-Woolies occupants including the Castle Café, which took over the site after Woolies closed, and a clothing and furniture store. Jim Edwards tells me that, as far as he’s aware, there are no specific plans for the building’s future use. One way or another, however, it looks like this fascinating and historically rich building will soon be starting yet another phase of its evolution as it nears its 300th birthday. Many thanks to Jim Edwards and to Sandra from Launceston Library for their help in filling in some of the gaps in the story of 5-7 Southgate Street.